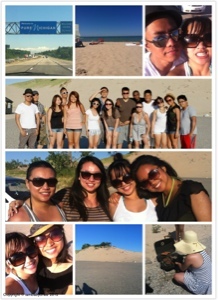 So last Friday, June 22, I went to Michigan Dunes with my friends. It was sooo much fun! I do believe I belong to the beach. We barbecued and dug a really big pit along the shore. My friends climbed the dunes and played in the clay pit. After wards we had some frozen yogurt.